Jean Pierre David dit Saint Michel was born between 1699 and 1700 in the Parish of Saint Nazaire, Diocese of Nantes, Lorie-Inférieure, Bretagne, France. Jean Pierre was a master blacksmith for the King of France, Louis XV, at the Fortress of Louisbourg, Cape Breton Island, Nova Scotia, Canada, from the early 1720's to the late 1750's. His family life story is so very much akin to the true life stories that are told over and over again of all French descendent and Acadian families that migrated from France to the new world in the 17th and 18th centuries. There, in Nouvelle France, they prospered, applied their trades and raisied large families. However though they were a peace minded people, they would also suffer great losses of life and property at the hands of the British Empire. 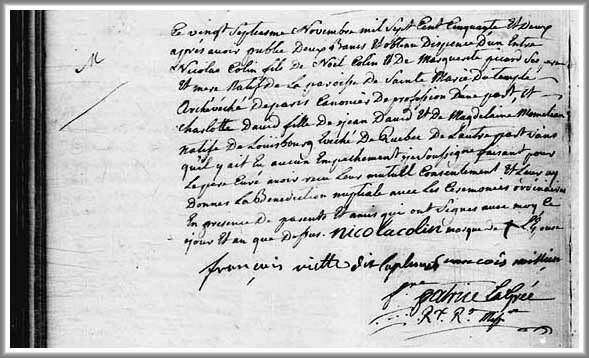 Although a primary source of his baptism record is yet to be uncovered, his place of origin is specifically documented within Jean Pierre's greffe burial record dated 30 April 1759 at the cemetery of the Hospital General of La Rochelle, France. In addition, this burial record states his age at death as 60 years which indirectly places his date of birth between 30 April 1699 and 29 April 1700. Le trente avril mil sept cent cinquante neuf par moi soussigné a été inhumé dans le cimetière de cet hôpital le corps de Jean David habitant de Louisbourg de la paroisse de St Nasaire éveché de Nantes de âgé de soixante ans environ décédé le jour précédent muni des sacrements de l’église ont assisté à son enterrement. JB Debroise, Le Biquais, Jean Limousin, J E Arivé On 30 April 1759, by me the undersigned, was buried in the cemetery of the hospital the body of Jean David inhabitant of Louisbourg of the parish of St Nasaire diocese of Nantes of sixty years died the previous day provided the sacraments of the church attended his burial. 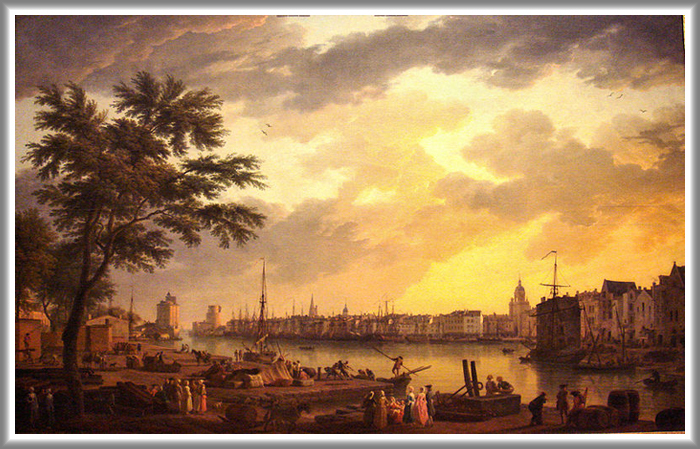 Numerous historical secondary source references record Jean Pierre's place and date of birth as Nantes, France in 1695. 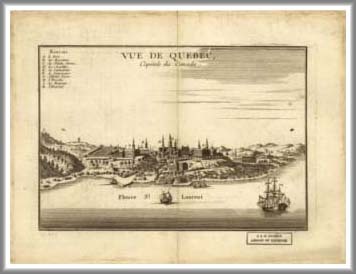 However besides his primary source burial record above which documents his place of origin as Saint Nazaire, only 3 primary source Louisbourg, Île Royale census records, listing the inhabitants of Louisbourg for the years 1724, 1726, and 1734 have been uncovered which record only his place of birth as Nantes. In all probability, this recorded place of birth could only have been passed on to the census writers for the King of France by the patriarch of this David dit Saint Michel family, Jean Pierre himself. Saint Nazaire is located on the western coast of France on the right bank of the Loire River estuary. It is a mere 40 miles down river from Nantes, France and possessed a population of about 500 inhabitants at the time of Jean Pierre's birth at the beginning of the 18th century. With Jean Pierre's primary source burial record and the Louisbourg census records as evidence and considering the close proximity of Saint Nazaire to Nantes, it is reasonable to assume that the area surrounding these 2 ancient communities narrows the place of Jean Pierre's birth between 1699 and 1700. Since no primary source baptism record has been uncovered to date to reconfirm Jean Pierre's date and place of birth, the identity of his parents remain unknown. In addition, a secondary source Family Reconstitution File, researched, abstracted and assembled by historians from these same primary source census records, documenting Jean Pierre's place of birth, is available on the research website of the Fortress of Louisbourg National Historic Site of Canada. As an adventurous young Frenchman in search of his quest for a new life beginning, Jean Pierre embarked on a journey, about 1714, that would lead him to the new world of Nouvelle France (New France). 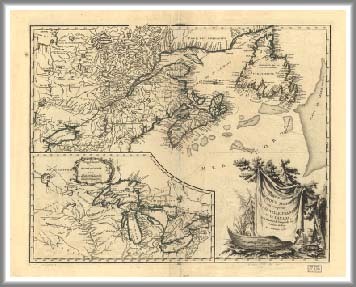 From what can be told, whether fact or assumption, Jean Pierre discovered that new beginning and lived a long and prosperous life through troubling times for the inhabitants of French descent who colonized Nouvelle France, particularly those French inhabitants of Québec, Île Royale and Acadie. Marrying a girl from Québec City about 1717, with whom Jean Pierre fathered 17 children, he provided for his family as a master blacksmith for the King of France, Louis XV, at the Fortress of Louisbourg from the early 1720's to the late 1750's. In his senior years, he was a well respected elder of the Louisbourg community and often referred to, within a number of primary source records, as Sieur Jean David. Although prosperous and fulfilling, the life of Jean Pierre and his wife, Marie Magdelaine Monmellian dit Saint Germain, was by no means free from the strifes the French inhabitants of Nouvelle France endured during those trying times of the early to mid-18th century. Together, Jean and Marie survived through the early deaths of several of their children, as well as, the 1st British siege of the Fortress of Louisbourg in 1745 and the deportation of many French inhabitants and their families to France that followed or the escape by others to refuge elsewhere in Nouvelle France. With the passing of Marie Magdelaine in early 1755, Jean Pierre's life struggles continued to a tragic and soon final ending. Sometimes after the fall season of the year 1755, he learned of the deportation by the British of his oldest surviving son, Michel, and family, then living in Grand-Pre, Acadie, to whereabouts he knew not, along with thousands of French Acadians and other French inhabitants of Acadie during "Le Grand Dérangement". 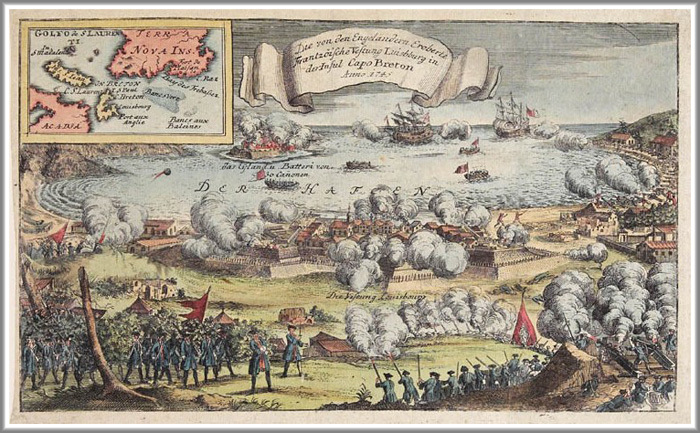 Finally, once again at the hands of the British Empire, the 2nd and last siege of the Fortress of Louisbourg in mid-1758 would see his divided family scattered to the winds of the world. Now divided, the exodus of the families of Jean Pierre's surviving children would lead them on separate paths, never to meet again, save possibily one. The journey of Michel and family, would lead them from Grand-Pré, Acadie to Snowhill, Maryland to New Orleans and Saint James, Louisiana. The deportation of the family of his oldest surviving daughter, Marie Josephe, would lead them from Louisbourg to Rochefort then Saint Malo, France. 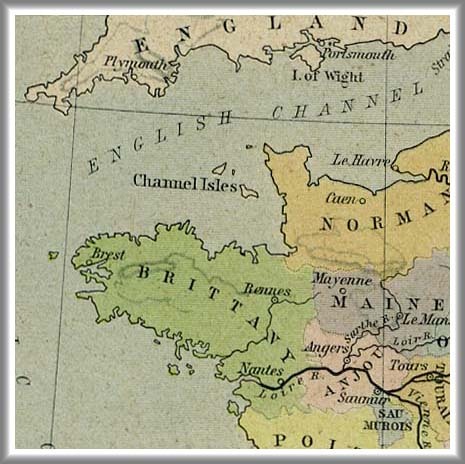 Jean Pierre's youngest known surviving son, Louis, would venture from Louisbourg to Bristol and Southhampton, England to France then on to Saint-Pierre et Miguelon and again to France and back. As for Jean Pierre's final journey, he and his daughters, Francoise Charlotte and Jeanne Olive along with Charlotte's family would exodus Louisbourg to La Rochelle, France. It would be Jean Pierre's last voyage, and his family would continue their journey without him to Saint Malo and Saint Servan, France, then 2 years later by way of Rochefort, France on to Kourou and Cayenne, French Guyana. Tragically, only one daughter would return to France alone and destitute. The other would remain in French Guyana, marrying into a status of stability which afforded her to live a long and prosperous life. Virtually nothing is known of the birth and infant years of Jean Pierre in or near Saint Nazaire, France. No records of these very early years of his life have yet been uncovered to provide any life story events of Jean Pierre as an infant or identify his immediate family including parents, brothers and sisters, as well as his extended family of grandparents, aunts, uncles and cousins. As Jean Pierre grew through his infant years, an ocean away across the vast Atlantic in the city of Québec, Nouvelle France, a girl child was born on 04 April 1698 to parents, Jean Baptiste Monmellian dit Saint Germain and Marie Helaine Juneau. This baby girl whom Jean Pierre would some day share most of his adult life with was named Marie Magdelaine Monmellian. It is with the birth of Marie Magdelaine Monmellian dit Saint Germain and with the primary source record of her baptism below, the oldest uncovered family record to date, that the commencement of this Jean Pierre David dit Saint Michel family timeline is established. Jean Pierre's adolescent and young adult years in France and his life events of those years also go unrecorded at this time. Whether or not Jean Pierre remained in the area of Saint Nazaire or Nantes, France during this period of time until his departure from France to Nouvelle France is unknown. However, a number of discovered primary source recordings between 1759 and 1771 could lead one to the assumption that Jean Pierre's family may have also had some presences in the Saint-Malo / Saint-Servan area on the northern coast of France. During these early years of the 18th century young men in France were driven by either political, religious or economic conditions or other motivations to begin a new life in the new world. Jean Pierre was probably one of these young men at the wandering and adventurous age of 16 to 19 years, who embraced the challenge and boarded ship passage to Nouvelle France. On 7 September, 1714, a primary source ship's passenger manifest lists a Jean David on a departing voyage of the 180 ton vessel, Saint-Joseph of Saint-Malo, mastered by ship's captain, Phillipe Le Viray with a crew of 68, departed from the port of Bordeaux, France bound for Cape Briton Island and returning to France on 8 October 1714. Within the same ship's manifest on 8 October 1714, a Jean David is listed a second time. Could this 2nd entry be Jean Pierre's arrival in the new world? It is unconfirmed that these Jean Davids is our Jean Pierre David dit Saint Michel, however, the timing, the ports of departure and the voyage destinations seem to indicate a viable possibility. Whether or not the assumption that these Jean David listings in the Saint Joseph's passenger manifest is our Jean Pierre, we do know that he arrived in Nouvelle France at some point during this timeframe and probably disembarked at Cape Briton Island or possibly one of the Nouvelle France ports-of-call along the Saint Lawrence River. Which ever port Jean Pierre disembarked at in the new world, the opportunities, to apply his trade, that presented themselves during the early construction of the Fortress of Louisbourg were promising. However, most of the population of New France at this time were male and very few females were available to marry. Could it be that Jean Pierre ventured to Quebec City to find a mate to marry and bare his children? It seems highly likely that he did. These early years of Jean Pierre’s life in Nouvelle France, also go unrecorded at this time. However, from clues further assumptions may be made of where he may have settled during this period, what he did for a trade, who he associated with socially and, most importantly, what fair maiden he courted to marry and raise a family. In 18th and 19th century Nouvelle France, as was in France, "the practice of adopting an alternative surname was extremely common in Québec..... The word dit...is a form of the word dire (to say) and can be loosely translated as "that is to say" or "called". ...The dit names sometimes followed the family through the generations..... ."1 Often, a dit name was adopted to indicated a location from where a family originated or to discern one family from another with the same surname or even to identify the first name of a revered ancestor. Sometime during this period, Jean Pierre adopted the dit name Saint Michel. It is not known if this adopted dit name identified a region in France or Nouvelle France but could very well have been associated with one of the small “Saint Michel” villages near Québec City, such as Saint-Michel-de-Bellchasse approximately 75 miles east of Québec City on the Saint Lawrence River. On the other hand, this adopted dit name could have been associated with the region in France in which Saint-Malo is located, i.e., it could have been associated with the 9th century medieval castle, Mont Saint Michel, located less than 20 miles from Saint-Malo on the northern coast of France. Or, it could also be associated with small French coastal village of Saint Michel Chef Chef a mere 12 miles south of Saint Nazaire across the mouth of La Loire. From all indications, it is believed that Jean Pierre’s marriage to Marie Magdelaine occurred about 1717, sometimes shortly after the Québec 1716 Census, which lists Marie Magdelaine as single at the age of 18 living with her parents, and the birth of Jean and Marie's 1st child about 1718. The actual date and place of their marriage is unknown at this time, however, the location of the marriage would probably have been somewhere between Québec City and the township of Louisbourg on the northern coast of Cape Breton Island (Île Royale). 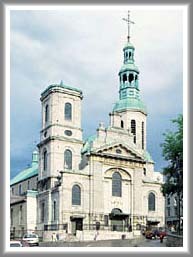 As is a traditional Roman Catholic marital custom often practiced still today, one might assume that there exists the possibility that Jean and Marie were married in the same Québec basilica-cathedral in which Marie was baptized in 1698, the parish of Notre-Dame de Québec, Roman Catholic Archdiocese of Québec, and the parish church of the oldest parish in North America originally built in 1647. Over 25 Monmellian family primary source records have been uncovered within the parish registers of Notre Dame de Québec between 1690 and 1764, including, the marriage and burial records of Marie Magdelaine's parents, as well as baptism, marriage and/or burial records of all Marie's siblings. These records indicate that the Monmellian family were very active parishioners of the parish of Notre Dame de Québec during this period. 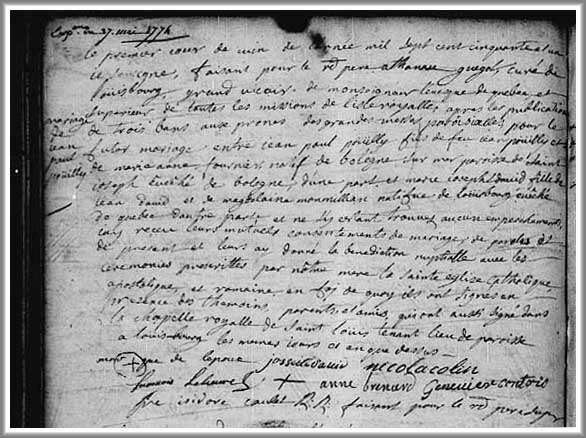 However, for 6 years, between the Québec 1716 Census and the Louisbourg primary source baptism record of their 4th child, Marie Josephe David, dated 8 November 1722, no record documenting the life events of Jean and Marie during this period has yet been uncovered, including their marriage record and the births of their 1st three children. Without a doubt, the primary source marriage record of Jean and Marie is the single most important document known to go undiscovered to date for this David family lineage. For if and when it is located, it should provide not only the date and place of their marriage but more importantly the names of the parents of Jean Pierrre David. Discovery of their names would, quite possibly, open research into a whole new prior generation or generations of this David dit Saint Michel family in Saint Nazaire, Nantes and/or throughout France. Jean Pierre and Marie Magdelaine quickly began their family between 1718 and 1721 with the birth of their 1st son, Pierre David , about 1718 followed by the birth of their 2nd son, Michel David, about 1719 and the birth of their 1st daughter, Magdeleine David, about 1721. The exact date and place of Pierre, Michel and Magdeleine's births are unknown at this time. However, Pierre and Magdeleine died at a very young age and Fortress of Louisbourg primary source burial records of Pierre, on 29 January 1730 at the age of 11 , and of Magdeleine, on 9 February 1733 at the age of 12 , seem to tie back to their approximate birth years. As for their places of birth, this period of Jean, Marie and their children's lives remain a mystery. Many questions go unanswered at this time. Were their 1st 3 children born in Québec City or Louisbourg or somewhere in between? Did Jean and Marie immediately move to the city of Louisbourg after their marriage? Prior to 1719, Louisbourg was a major French settlement and fishing port, and would have needed the skills of a blacksmith that Jean Pierre possessed. Since most of the early church records for Louisbourg before 1722 were lost, it is quite possible that these 3 children may have been born at Louisbourg. Since Nantes was very near his recorded place of origin and was the capital of the province of Brittany, Jean Pierre may have grown up in this large city and not the rural area of Saint Nazaire. A city like Louisbourg would probably have had more appeal to him than a rural farming community in Acadie. Furthermore by far in the region, Louisbourg was where the opportunities for a livelihood and subsistence existed. 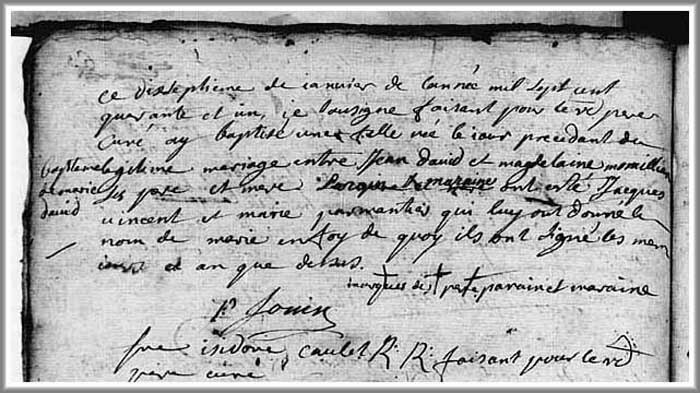 The 1st primary source documented evidence which records Jean Pierre's presence in Nouvelle France, as well as, in Louisbourg is the birth of his and Marie Magdelaine's 2nd daughter and 4th child, Marie Josephe David, on 08 November 1722 in Louisbourg and baptized the following day, 09 November 1722. Her godparents were Philippe Carrerot, store-keeper for the King, and the widow Madame Marie Bertrand de Villejoin. Fre Claude Sanquet, Recoleta Commissioner and Vicar General presided at the baptism. Marie Josephe was one of the 5 most recorded children of Jean Pierre and Marie Magdelaine between 1722 and 1758 at the Fortress of Louisbourg. The 1724, 1726 and 1734 Louisbourg Census records indirectly indicate her presence in Louisbourg for those years. She seemed to have been a very popular choice for godmother at baptisms, having been asked to be the maternal spiritual guidance for at least 4 children of close friends at Louisbourg. Marie Josephe married at the age of 29 in 1751 and gave birth to 4 children, 2 boys and 2 girls. Her life was cut short as a result of hardships endured during the 2nd British siege of Louisbourg in the summer of 1758 and she died shortly thereafter, at the age of 36, during or after arrival from her family's deportation voyage to Rochefort, France in the fall of that same year. Her surviving husband and 3 children struggled on in France and were recorded there for 16 years until 1774. Further documented evidence which establishes Jean Pierre "in Louisbourg at least by 1723, if not earlier and still alive in 1757, in his house in Louisbourg" has been extracted and compiled from original source documents in the Fortress of Louisbourg Historical Memoranda Series 1964 to Present H F 25 1989 titled Jean Pierre David dit Saint Michel: Blacksmith authored by Eric Krause, Krause House Info-Research Solutions. In this memoranda it's noted that Jean Pierre was a “master blacksmith” by profession. Its also noted that he was the “King’s Master Blacksmith in 1729, so perhaps his presence in a King’s forge in 1744 would not have been out of place”. Furthermore, this abstract documents a few of Jean Pierre's forge work activities at Louisbourg including in "1734: Repaired a Micmac Missionary Building ", in "1735: Worked on the King's Block 13 Hospital" and worked on between "1736 and 1737: Unspecified Government Work". Jean Pierre worked his trade at the King's forge and lived with his family within the Fortress of Louisbourg at his home located at "Block 32 West, Lot B from 1723 to at least 1757. The house faced Rue Dauphine" at the corner of Rue de France. In 1960 the Canadian Government decided to reconstruct part of Louisbourg as a 1967 centennial project in order to help the Cape Breton economy by increasing its touristic potential. As an instrumental part of that project, Yvon LeBlanc, First Resident Architect, Fortress of Louisbourg, 1972-1983 drafted a 12 plate birds eye view architectural drawing known as "The History of the Architecture and Reconstruction of Louisbourg". 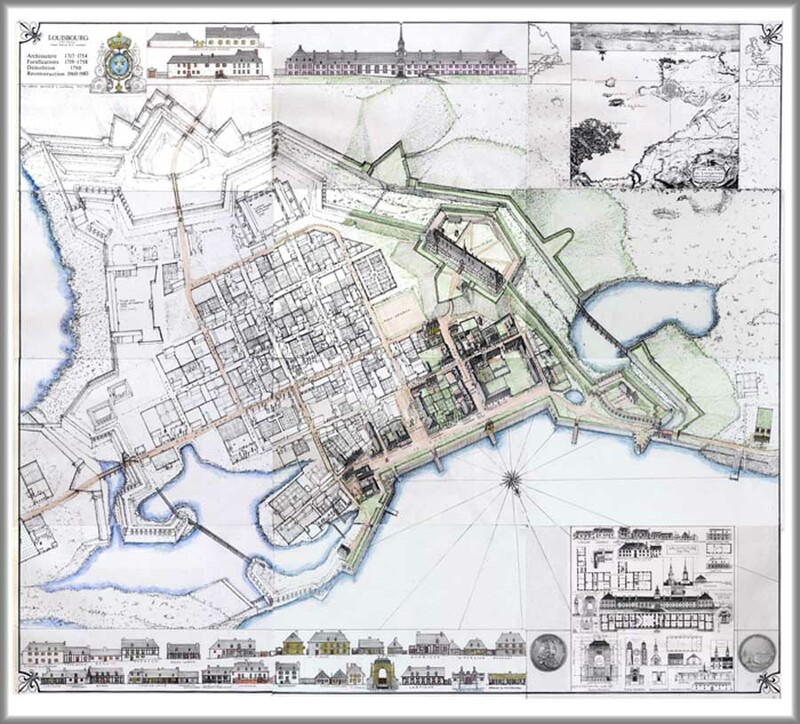 Note: The architectural map above is divided into 12 plates with embedded links to a detail rendering of each plate residing on the Archives of Louisbourg website. To access a drawing plate, hover over that plate, with your cursor, on the image above and click to access the detail drawing of that plate. Once you have displayed the plate from the Archives of Louisbourg website, point and click on the plate drawing and it will zoom in to greater detail of that plate centered on the spot your cursor was pointing to. Then use the left/right and up/down scroll bars to navigate through the image. Click on the plate again and it will zoom out to a lesser detail image of the plate. Within the Plate B2 rendering below, the home of Jean Pierre David and family is located in the lower right hand corner of the plate (2nd plate from the top 1st row above). The King’s forge where Jean applied his trade is illustrated in the lower right hand corner of Plate B3 (2nd plate from the top 2nd row above). 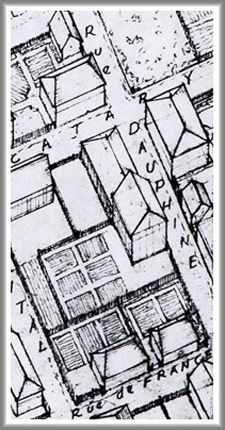 The family home is further portrayed in the detailed illustration below at the intersection of Rue Dauphine and Rue de France. A 1734 Fortress of Louisbourg "official Government property survey, the State of Lands Granted to Louisbourg and Île Royale, issued by Messieurs de Saint-Ovide and the Standard to the Minister noted within: A Jean David dit Saint Michel, a blacksmith, a plot 50 feet front on the Rue de France, and 66 feet deep along Rue Dauphine, limited to north by the Rue de France, which is the land of Philibert Pineau dit Lajeunesse, south by the Gaspar de Milly, and west by the Rue Dauphine, by concession of 2 May 1723". The primary source document image of Jean Pierre's land grant is illustrated below. 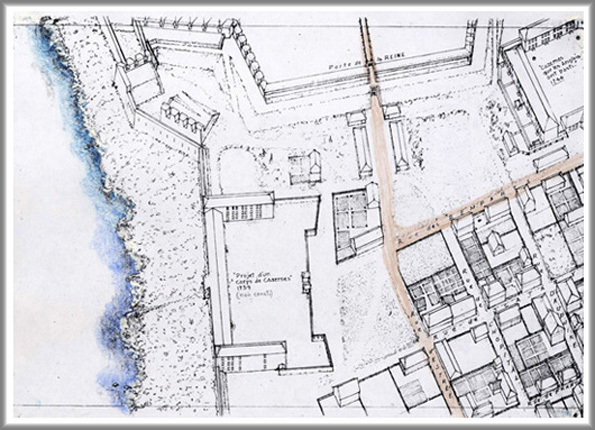 The Fortress of Louisbourg plans below and their corresponding detailed illustrations portray the layout of the Fortress and the relative location of the Jean David family home at Block 32 West, Lot B between 1723 and 1758. Note: The orientation on the above Louisbourg map is <-- west to east -->. Note: The orientation on the above Louisbourg map is <-- east to west -->. It should be noted that from 1745 to 1749 Jean Pierre and family were probably one of the many Louisbourg families exiled to France by the British after the 1st siege of Louisbourg. However, upon their repatriation to Louisbourg in 1749 the David family resumed their residency at their home at Block 32 West, Lot B.
Jean Pierre's life and trade provided him with the opportunity to acquired numerous influential and important friends at Louisbourg, including, Philippe Carrerot, the Keeper of the King's Storehouse, Francois Ganet, the King's Contractor for all of the Fortifications, Francoise Charlotte Aubert, wife of Monsieur De La Perelle, of Block 17, Louis Levasseur, Lieutenant General of the Admiralty and Anne Lefron, wife of Monsieur Benoist of Block 2. Marie Magdelaine's younger sister, Genevieve Monmellian dit St. Germain, followed her older sister to Louisbourg and was also married to a master blacksmith, Guillaume Joseph Opinel. The David's and the Opinel families were probably very close and they lived and probably shared close family ties together. It is also highly likely that Jean and Guillaume worked their trades together, if not at their forge, at least on many of the King's projects. Jean Jacques David, 3rd son and 5th child of Jean Pierre and Marie Magdelaine was born on 19 June 1724 at Louisbourg and baptized on that same day. His godparents were Jacques Badeau, captain of the ship, and Marie Magdelaine's sister, Genevieve Monmellian. Fre Claude Sanquer, Superior Cure and Vicar General presided at the baptism. Witnesses attending Jean Jacques' baptism were Francois La Cher and Louis Le Page. Very little is known of Jean Jacques' life for only 2 primary source records have been uncovered which list his name. These include his baptism record in 1724 and the Louisbourg 1749-1750 Census. His name is also listed within 2 Fortress of Louisbourg secondary source abstract documents, a Family Reconstitution File and a Historical Memoranda of his father, Jean Pierre David. In addition, the Louisbourg 1724, 1726 and 1734 Census records indirectly indicate his presence in Louisbourg for those years. From these records we can determined that Jean Jacques was alive and still living with his family in Louisbourg at the age of 26 in 1750. During the 18th century, tradesmen, such as blacksmiths, were experts at their trade but in most cases were illiterate and could neither read nor write the King's French. Jean Pierre, in all probability, was such a tradesman. Within the baptism record below, dated 3 July 1724, for Jean Joseph Opinel, the son of Jean Pierre's sister-in-law, Genevieve Monmellian, Jean David's name appears on the third line of this record as the godfather of the child. In addition, a signature of Jean David clearly appears at the bottom of the record. However, the script of this signature is in a different hand than the hand of the priest, Fre Claude Sanquet, who authored the baptism record. However, if you look closely at the script of this signature, in particular the letter J, and compare it to the script in the signature to the right of Jean’s, one can deduce that his brother-in-law, Guillaume Joseph Opinel, signed Jean’s signature for him. As further proof confirming that Jean Pierre was illiterate, extracts from the 3 primary source baptism records displayed below clearly list his signature as an "X" over the Ole French script "marque du pere" which translates in English to "mark of the father. 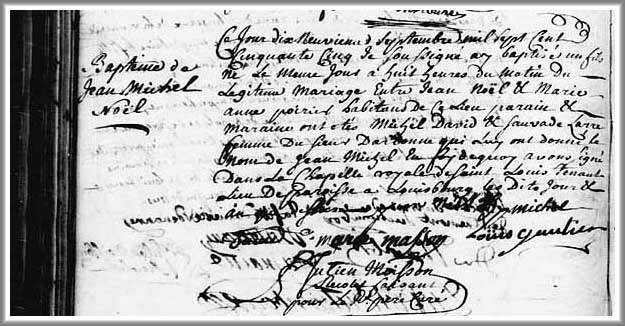 The 3 "X" signatures of Jean Pierre appear in the baptism records of his children, Francois in 1727, Marie Magdeleine in 1741 and Jeanne Angelique in 1743. Jean's early presence in Louisbourg is recorded in the "General Census of established residents of Île Royale in the year 1724. Census roll signed by De Mézy as officer and writer for the king". This census roll lists Jean David dit Saint Michel of Nantes, a blacksmith, a wife, Marie Magdelaine, 3 sons under 15, Pierre, Michel and Jean Jacques and 2 daughters, Magdeleine and Marie Josephe. Jean Baptiste David, 4th son and 6th child of Jean Pierre and Marie Magdelaine, was born on 22 July 1725 at Louisbourg and baptized the following day, 23 July 1725. His godparents were Jean Richard and Marie Cecile Boucher. Presiding at the baptism for the Abbot was Fre Jordore Caulet. Jean Baptiste's Act of Baptism record notes that his father, Jean David, was at that time a "blacksmith and resident of Louisbourg." Little is also known regarding Jean Baptiste’s life at Louisbourg between 1725 and 1758. Only 3 primary source records have been uncovered which list his name. These include his baptism record above in 1725, the Louisbourg Census of 1749 to 1750 and his burial record in 1758. In addition, the 1726 and 1734 Louisbourg Census records indirectly indicate his presence in Louisbourg for those years. The timing of his death at the age of 32 on 18 March 1758 may have indicated that Jean Baptiste was a Fortress of Louisbourg soldier and died in the line of duty during one of the many war time skirmishes leading up to the 2nd siege of the Fortress of Louisbourg on 26 July 1758. The partial abstract of the Family Reconstitution File of the Louisbourg 1726 Census continues to coincide with the 1724 Census and the addition of Jean Baptiste to Jean and Marie's family. Almost 2 years after the birth of Jean Baptiste, Jean Pierre and Marie Magdelaine's 5th son and 7th child, Francois David was born on 16 June 1727 at Louisbourg and baptized on the same day. 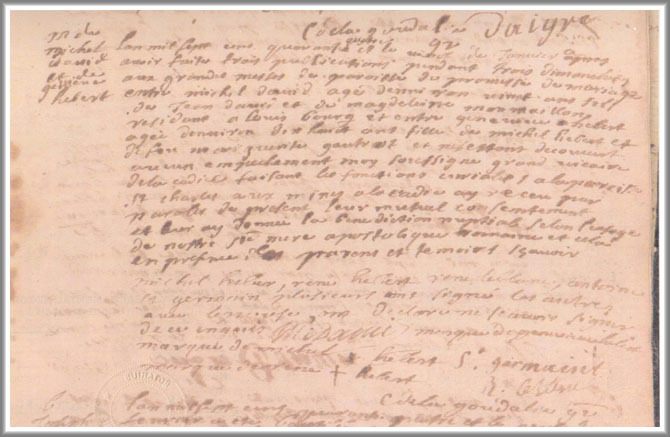 His Louisbourg Act of Baptism records that Francois' godparents were Francois Darpix (signature: Francois Dardy) and Clere Marlin. Fre Michel Ange le Durf presided for the Father Superior Abbot at the baptism. The witness attending Francois' baptism was Jean Bernard. The baptism record above is of significance importance for it is the 1st of 3 recordings of the signature of Jean Pierre as an "X" over the "mark of the father, i.e., "marque du pere" at the end of the baptism record, further confirming that Jean Pierre was illiterate. The other 2 signatures of Jean Pierre are noted in the baptism records of Francois' younger sisters, Marie Magdeleine in 1741 and Jeanne Angelique in 1743. Only 2 primary source records have been uncovered to date which list Francois’ name that tell of his life at Louisbourg between 1727 and 1745. These include his baptism record above in 1727 and another baptism record that lists Francois as a witness on 9 September 1753. In addition, the 1734 Louisbourg Census record indirectly indicates his presence in Louisbourg for that year. Francoise Charlotte David, the 3rd daughter and 8th child of Jean Pierre and Marie Magdelaine, was born at Louisbourg on 10 April 1729 and baptized the following day, 11 April 1729. Francoise's godparents were Francois Ganet, contractor for the work of King in this city and Francoise Aubert Charlotte, wife of Monsieur De La Perelle, Lieutenant D’ Urie company of the garrison. Fre Zacharie Caradec, Commissioner Recoleta Missionaries from Brittany and Parish Priest of Louisbourg presided at the baptism. The witnesses attending Francoise' baptism was Rene Seanoir. It is quite possible that Francoise later adopted her godmother's name, Charlotte, by which she is referred to in numerous later abstract documents. In 1759, Charlotte and her 2nd husband along with her sister, Jeanne Olive, and his children from a previous marriage are deported to France as a result of the 2nd siege of Louisbourg by the British. Jean Pierre dies during that voyage and the surviving family struggles to make ends meet for a couple of years in Saint-Servan, France. In 1763, the family migrates to French Guyana to start a new life along with a number of other French-Acadian exiled families. However, that venture ends in the tragic death of Charlotte’s husband in 1764. Now in a state of destitution over debt owed by her husband to the crown, Charlotte is forced to leave her sister Jeanne Olive with Jeanne’s 1st husband, and travels back to France in 1765 to seek from the crown resolution and forgiveness of the debt owed. It is believed that Charlotte eventually migrated back to the Saint-Servan / Saint-Malo, Nantes or Saint Nazaire, France areas where it is also believed that the Jean Pierre David family may have originated or lived at one time. On 29 January 1730 at the age of 11 years, Pierre David, 1st son and child of Jean and Marie Magdelaine, died and was buried the following day, 30 January 1730, in the Cemetery of the Church Convent and Parish of Louisbourg. The cause of Pierre's death at such a young age is unknown. He would be the 1st of 4 of their children to die at a very young age. Fre Zacharie Caradec, Recolet Vicar General, Commissioner Recoleta Missionaries from Brittany and Parish Priest of Louisbourg presided at the burial. All that is known of Pierre's brief life is that he was born the 1st child of Jean Pierre and Marie Magdelaine about 1717 within or near Québec City or somewhere between there and the Fortress of Louisbourg. The burial transcription record above is the only source record uncovered that directly lists his name. In addition, the 1724 and 1726 Louisbourg Census records indirectly indicate his presence in Louisbourg for those years. Etienne Thomas David, the 6th son and 9th child of Jean Pierre and Marie Magdelaine, was born on 20 December 1730 at Louisbourg and baptized the following day, 21 December 1730. His godparents were Sieur Etienne Caesar Leverrier and Anne Benoist. Fre Zacharie Caradec, Recoleta Vicar General and Parish Priest of Louisbourg presided at the baptism. Witnesses attending the baptism were Thomas Verrier and Magdeleine La Rivieri. Louis David, the 7th son and 10th child of Jean Pierre and Marie Magdelaine, was born on 02 September 1732 at Louisbourg and baptized the same day. His godfather was Sieur Louis Levasseur, Lieutenant General of the Admiralty, and his godmother was Dame Anne Lefron, wife of Monsieur Benoist, ensign of Company aide to major of troops of this garrison. Fre Zacharie Caradec, Recoleta Vicar General, Commissioner of Missions of Île Royale and of St. Jean, Parish Priest of Louisbourg, presided at the baptism. Witnesses attending the baptism were Margaret Depre. Louis was another of the 5 most recorded children of Jean Pierre and Marie Magdelaine. Source records document his family's life story spanning the years from his birth in 1732 to a daughter's marriage in 1790. The 1734 Louisbourg Census record indirectly indicates her presence in Louisbourg for that year and his name is listed in the 1749 - 1750 Louisbourg Census. Louis served his country in one of the Louisbourg regiments as a cannonier by profession and was captured, along with his 2 brothers Claude Thomas and Jacques Andre by the British during the conflicts which lead up to the 2nd siege of the Fortress of Louisbourg in 1758. 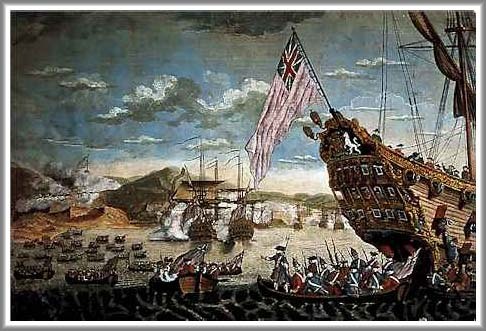 As prisoners of war, they were transported by the British first to Bristol, England in 1759, and later to Southampton on May 14, 1763. They were then transported to France on May 26, 1763 on the frigate La Dorthee. Louis returned to Nouvelle France at some point during the summer of 1763 and married Anne Trahan at Saint Pierre in November of 1763. During the next 16 years, Louis and Ann raised a family of 8 children in Saint Pierre until they were deported by the British to France in 1778. Louis' family is listed on a general list of the inhabitants of the islands of St. Pierre and Miquelon, which his Majesty has provided sustenance at La Rochelle in 1779. By 1784 Louis, Anne and at least 3 of their children had been repatriated back to Saint Pierre from France and were listed in the 1784 Census of Saint Pierre. Louis and Anne's last source recording is at the marriage of their daughter, Angelique Claire Marie in the summer of 1790 at Saint Pierre. During 1732 and 1733, a smallpox epidemic sweeps through Louisbourg causing the deaths of 151 inhabitants. It is said to have been carried to Louisbourg on the King's ship Les Rubis. There is the possibility that this smallpox epidemic was the reason for additional great sorrows within this David family. On 09 February 1733, Jean and Marie's 1st daughter Magdeleine died at the young age of 12, quite possibly from the Louisbourg smallpox epidemic of 1732 and 1733. All that is known of Magdeleine's brief life is that she was born the 2nd child of Jean Pierre and Marie Magdelaine about 1721 within or near Québec City or somewhere between there and the Fortress of Louisbourg. The burial transcription record above is the only source record uncovered that directly lists her name. In addition, the 1724 and 1726 Louisbourg Census records indirectly indicate her presence in Louisbourg for those years. The excerpt from Magdeleine's burial record above, ".....fille de Pierre David dit St Michel et de Marie Magdelaine Monmillon....." is of significant importance for it is the only known recording of Jean's given baptismal name, Pierre. Within 2 months after the death of his older sister, Magdeleine, on 01 April 1733, at the infant age of 2 years, Jean and Marie's 6th son Etienne Thomas passed away. Between the Louisbourg Census of 1726 and 1734, Jean and Marie tragically buried 3 of their children, Pierre in 1730 and Magdeleine and Etienne Thomas in 1733. During this same period, 3 new children, Francois in 1727, Francoise in 1729 and Louis in 1732, were born into their family. The Family Reconstitution File based on the Louisbourg 1734 Census seems to account for all family members at that time. It also lists Jean David dit Saint Michel of Nantes, a blacksmith, his wife, 4 sons under 15, who would have been Jean Jacques, Jean Baptiste, Francois and Louis, and 2 daughters, who would have been Marie Josephe and Francoise Charlotte. In 1734, their 2nd son, Michel would have been at least 15 years of age or older and for that reason was possibly not included in this census. Claude Thomas David, the 8th son and 11th child of Jean Pierre and Marie Magdelaine, was born on 20 December 1735 at Louisbourg and baptized the following day, 21 December 1735. His godfather was his older brother, Michel David, and his godmother was Marie Therese Perrin. Fre Isidore Caulet, RR, presided at the baptism for the Abbot. Witnesses attending the baptism were Dreville and Marie Josephe Lemoiniere. Very little is known of Claude Thomas' life story between 1735 and 1763. His name is listed in only 2 primary source records, including, his baptism record in 1735 and the Louisbourg Census of 1749 to 1750. He served his country as a seaman by profession in one of the Louisbourg marine regiments and was captured, along with his 2 brothers Louis and Jacques Andre by the British during the conflicts which lead up to the 2nd siege of the Fortress of Louisbourg in 1758. As prisoners of war, they were transported by the British first to Bristol, England in 1759, and later to Southampton on May 14, 1763. They were then transported to France on May 26, 1763 on the frigate La Dorthee. No further record has been uncovered of Claude Thomas' life after 1763. Jacques Andre David, the 9th son and 12th child of Jean Pierre and Marie Magdelaine, was born on 30 November 1737 at Louisbourg and baptized the same day. His godfather was Jacques Vincent, and his godmother was his older sister, Marie Josephe David. Fre Athanase Guegot, priest, presided at the baptism. Witnesses attending the baptism were his older brother, Michel David and Marie Josephe Laumonier. Very little is known as well of Jacques Andre's life story between 1737 and 1763. His name is listed in only 2 primary source records, including, his baptism record in 1735 and the Louisbourg Census of 1749 to 1750. He served his country as a seaman by profession in one of the Louisbourg marine regiments and was captured, along with his 2 brothers Louis and Claude Thomas by the British during the conflicts which lead up to the 2nd siege of the Fortress of Louisbourg in 1758. As prisoners of war, they were transported by the British first to Bristol, England in 1759, and later to Southampton on 14 May 1763. 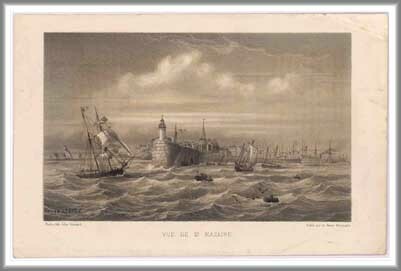 They were then transported to France on 26 May 1763 on the frigate La Dorthee. No further record has been uncovered of Jacques Andre's life after 1763. Jeanne Olive David, 4th daughter and 13th child of Jean Pierre and Marie Magdelaine, was born on 10 July 1739 at Louisbourg and baptized the same day. Jeanne Olive's godparents were Gilles Burett, captain of the ship in this port and Jeanne Durand. Fre Athanase Guegot, Commissioner Parish Priest presided at the baptism. The witnesses attending Jeanne Olive's baptism were Elizabeth Rand, Jean Baptiste Doret, Jane Durand and Buret. Jeanne Olive’s life story is possibly the longest source documented of Jean Pierre and Marie Magdelaine's children beginning with her birth in Louisbourg in 1739 and her death in Cayenne, French Guyana in 1805. Her presence in Louisbourg is listed in the 1749 - 1750 Louisbourg Census. In 1759, Jeanne Olive along with her older sister, Charlotte, their father, Jean Pierre and Charlotte's 2nd husband and his children from a previous marriage were deported to France as a result of the 2nd siege of Louisbourg by the British. Jean Pierre dies during that voyage and the surviving family struggles to make ends meet for a couple of years in Saint-Servan, France. In 1763, the family migrates to French Guyana to start a new life along with a number of other French-Acadian exiled families. In 1764, Jeanne Olive marries her 1st husband, a master wheelwright by profession, in Cayenne, French Guyana. Her husband dies in 1767, just a year and a half after Charlotte returned to France in 1765 after the death of Charlotte's husband in 1764. Alone in a strange country with no children by her 1st husband, Jeanne Olive marries her 2nd husband, a prominent notary to the King of France, with whom she bares 5 children. At the age of 65, Jeanne Olives dies in French Guyana in 1805 without, in all probability, any known contact with her David family since that with Charlotte in 1765. This baptism record is the 2nd of 3 primary source recordings of the signature of Jean Pierre clearly illustrating an "X" over the "mark of the father, i.e., "marque du pere" at the end of the baptism record. All that is known of Marie Magdelaine's brief 10 years of life at the Fortress of Louisbourg is recorded in 2 primary source records. Her name is listed in her baptism record in 1741 and her burial record in 1752. Her presence in Louisbourg is also directly listed in the 1749 - 1750 Louisbourg Census. Jeanne Angelique David, the 6th daughter and 15th child of Jean Pierre and Marie Magdelaine, was born on 21 December 1743 at Louisbourg and baptized the same day. Her godfather was Pierre Jouin, and her godmother Jeanne Bauche. Fre Athanase Guegot presided at the baptism. 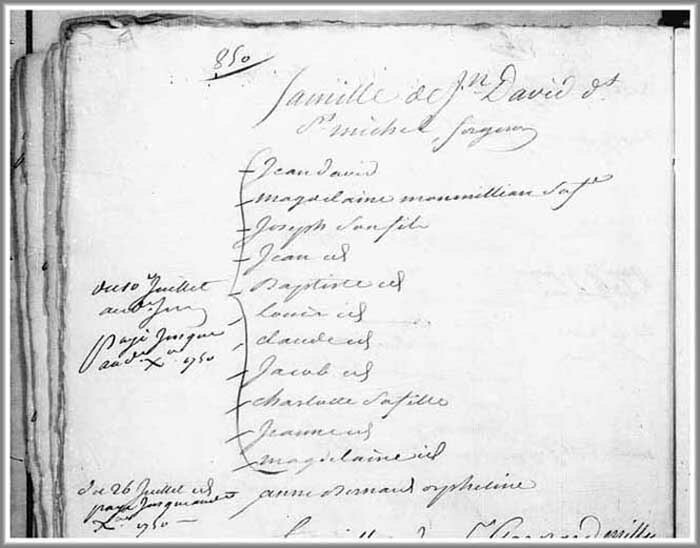 Her baptism record lists her father's name as "Sieur Jean David, a resident of this parish", a title given to a person of great respect in the Louisbourg community. This baptism record is the 3rd of 3 primary source recordings of the signature of Jean Pierre clearly illustrating an "X" over the "mark of the father, i.e., "marque du pere" at the end of the baptism record. All that is known of Jeanne Angelique's life at the Fortress of Louisbourg is recorded in 1 primary source record which lists her name in her baptism record of 1743. Her further presence in Louisbourg is not listed in the 1749 - 1750 Louisbourg Census. According to Eric Krause's Memorandum HF 25 1989, Jean Pierre and Marie Magdelaine were still living at Louisbourg in 1744 along with their surviving children of "5 boys for certain, possibly 6 and 5 girls." These children would probably have included their sons Jean Jacques, Jean Baptiste, Francois, Louis, Claude Thomas and Jacques Andre and their daughters Marie Josephe, Francoise Charlotte, Jeanne Olive, Marie Magdeleine and Jeanne Angelique. The "possibly 6" son referred to was probably Michel who married Genevieve Hebert on 20 Jan 1744 in Grand-Pré, Acadia and was probably living there with his wife. Of all the David dit Saint Michel family life events documented herein, excluding the births of Jean Pierre and Marie Magdelaine and their marriage, had it not been for the births and marriage of Michel and Genevieve, future generations of their Louisiana David descendents would not exist today. On 20 January 1744, at the age of 20 years, Michel David son of Jean David and Magdelaine Monmellian of Louisbourg married Genevieve Hebert daughter of Michel Hebert and the late Marguerite Gautrot. The witnesses attending the marriage were Michel Hebert, Antoine St. Germain and Rene LeBlanc. Very little is known of the live of Francois David. Only 2 primary source records have been uncovered to date which list Francois’ name and tell of his life between 1727 and 1745. These include his Louisbourg baptism record in 1727 and his Rochefort, France burial record in 1745. In addition, the 1734 Louisbourg Census record indirectly indicates his presence in Louisbourg for that year. The burial records of Jeanne Angelique and Francois place the family of Jean Pierre and Marie Magdelaine in Rochefort by December of 1745. From that date until 1749, when they return to Louisbourg, their life during these 4 years remains unknown. Nor is it known if they remained in the Rochefort area or migrated north towards Jean Pierre's birthplace of Saint Nazaire and Nantes, France. No further records of the David family's life between 1746 and 1749 have been yet uncovered. The records of their lives and whereabouts pick up once again with the Louisbourg Census of 1749-1750 and the marriage of their daughter, Marie Josephe David, on 1 June 1751 in Louisbourg. Their exile from Louisbourg did not deter Jean Pierre and Marie Magdelaine from growing their family. For when they returned to the Fortress in about 1749 they did so with 2 new boys, Joseph and Jacob. Joseph David was born between 1745 and 1749 during Jean Pierre and Marie Magdelaine exile from Louisbourg after the 1st siege of Fortress of Louisbourg in 1745. Virtually nothing is known at this time of Joseph's date or place of birth. Jacob David was born between 1745 and 1749 during Jean Pierre and Marie Magdelaine exile from Louisbourg after the 1st siege of Fortress of Louisbourg in 1745. Virtually nothing is known at this time of Jacob's date or place of birth. Since it is recorded that there were 11 surviving children in 1744 living with the family at Louisbourg prior to their deportation from the Fortress in 1745, it is not known for certain which children accompanied Jean and Marie from Louisbourg to France. After their return only 7 of these children plus 2 new additions to the family are recorded in the Louisbourg Census of 1749-1750 to be living with the family in Louisbourg. During this period, it is unknown where (3) of Jean Pierre and Marie Magdelaine's children may have spent these four years. It is highly likely that Michel, having just been married in 1744, may have been in Grand-Pré, Acadie with his new wife, Genevieve. However, the whereabouts of Marie Josephe and Jacques Andre during this period are unknown. The Family Reconstruction File based on the Louisbourg 1749-1750 Census indicates that these (3) children were not living with Jean Pierre and Marie Magdelaine when they were repatriated to Louisbourg in 1749 from their exile. When Jean Pierre and Marie Magdelaine returned to Louisbourg in 1749, they did so with 9 children and an orphan. These included 2 new sons, Joseph and Jacobs, who apparently were born during the 4 years of their exile. According to the Louisbourg Census of 1749-1750, it appears that the other (7) children returning to Louisbourg from exile were Jean Jacques, Jean Baptiste, Louis, Claude Thomas, Francoise Charlotte, Jeanne Olive and Marie Magdeleine. On 1 June 1751 at the age of 28, Marie Josephe married Jean Paul Pouilly son the late Jean Pouilly and Marie Anne Fournier, native of Boulogne-sur-Mer, France, parish of Saint Joseph Bishopric of Boulogne. The witnesses attending the marriage were Francois LeLievre, Anne Bernard, Josseite Darcir, Nicolas Colin and Genevieve Coretois. Fre Isidore Caulet presided at the marriage. On 29 January 1752 at the age of 10 years, Marie Magdelaine David died and was buried the following day, 30 January 1752, in the Cemetery of Louisbourg. Fre Isidore Caulet presided at the burial. The cause of Marie Magdelaine's death at such a young age is unknown. She would be the 4th of 4 of their children to die at a very young age. Ironically according to documented abstracts, her death followed exactly 12 years to the day of the death of her older brother Pierre at the young age of 22 years on 29 January 1730. On 27 November 1752 at the age of 23, Francoise Charlotte, daughter of Jean David and of Magdelaine Monmellian, native of Louisbourg, Diocese of Québec married Nicolas Colin, son of Noel Colin and Marguerite Picard, native of the Parish of Saint Marie of the Temple, Archbishop of Paris; gunner by profession. Publication of two bans and waiver of two others are noted on the marriage record. Fre Patrice LeGree presided at the marriage. Witnesses attending the marriage included Francois Viette dit LaPlume and Francois Millien. Other signatures noted on the marriage record included Nicolas Colin and Francoise Charlotte signed with an "X". The year of 1755 was a monumental turning point for present and future generations of the David dit Saint Michel family. For in 1755, two life events occurred that would, first, partially close the chapter of the present generation and, secondly, open the chapters and direction of future generations and descendents to come. These events were the death of the then matriarch of the family, Marie Magdelaine and the family events surrounding her 2nd son, Michel, his wife Genevieve Hebert and their family during Le Grand Dérangement. On 1 May 1755 at the age of 60 years Jean Pierre's wife, Marie Magdelaine Monmellian, who had shared his life for 38 years and who had born him 17 children, died and was buried in the Cemetery of Louisbourg. Fre Julien Moisson presided at her burial. The cause of her death is unknown. On 2 September 1755, British forces' Colonel John Winslow ordered all male Acadians 10 years and older at Grand-Pré, Acadie to assemble in Saint Charles-des-Mines Church in order to inform them that everyone and their families were to be deported from their home land. Winslow had a list prepared of all of the men and boys confined to the church in order to determine family names, the number of individuals detained, and if anyone was missing. Michel David's name was not on Winslow's list. The only David listed was a Jean Baptiste David, married to Marie Josette. As we know as fact, Michel and his family were deported together to Snow Hill, Maryland for eleven years. The question was, "Where was Michel when all the Grand-Pré Acadians were being rounded up"? During one of fellow David family genealogist, Robert David's searches of the Fortress of Louisbourg archives databases, he came across the baptism record below for a Jean Michel Noel. 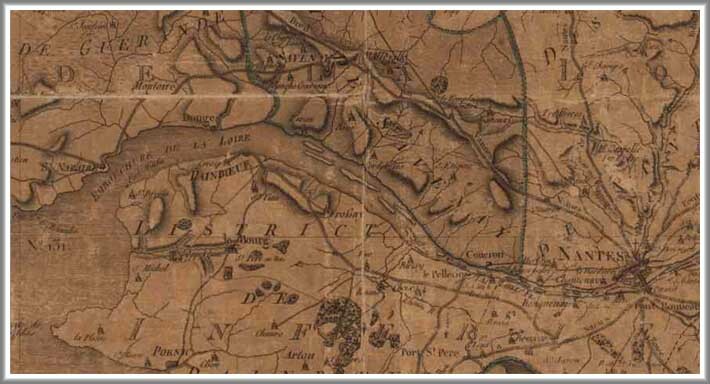 Within this primary source record was the answer of Michel's whereabouts during the 1755 deportation of the Acadians from Acadie and the beginning of Le Grand Dérangement . Jean Michel Noel's godfather was listed as Michel David, and he was also listed as signing the church register as a witness. 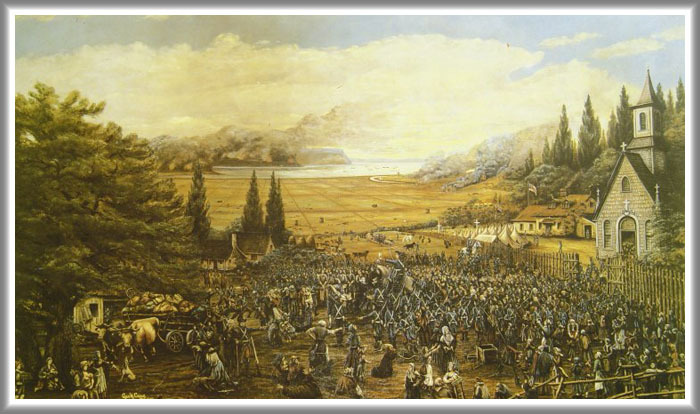 The date of the baptism was 19 September 1755, seventeen days after the British rounded up the Acadians at Grand-Pré. Michel was probably in Louisbourg visiting his family and getting blacksmith supplies. His mother, Marie Magdelaine, had recently died four months earlier that year in May and his sister, Marie Josephe, had given birth to her 1st daughter in June. Michel, having received word of the planned deportations by the British of Acadian families at Grand-Pré, somehow managed to return to Grand-Pré from Louisbourg, some 300 miles away, in time to rejoin his family before the sloop Elizabeth with 242 Acadian deportees aboard sailed on the 27th of October 1755 for the east cost of Maryland. On 17 November 1757, Charlotte's 1st husband, Nicolas Colin dit Saint Lionnon, at the age of 35 years, died at the Hospital of Louisbourg. He was a native of the diocese of Paris, parish of Saint Mary. Nicolas' profession was a foundry worker and a soldier of the company of Saint Mary. He was the son of Noel Colin, a professional domestic, and of Marguerite Picard who were engaged in Rochefort, 1 May 1735. Since it is confirmed that Nicolas was a soldier and cannonier at the Louisbourg garrison in the company of Saint Mary and it is confirmed that he died in the hospital at Louisbourg. Therefore, it is possible the he may have died from wounds received in one of the many military attacks by the British on the Fortress occurring during the British's Louisbourg Expedition of 1757. However, there is no confirmed source at this time that supports this assumption. Now a widow with no children to take care of, Charlotte, the oldest daughter at home, most likely turned her attention to caring for her father, Jean Pierre, and his household. He was now 64 and probably not actively working as a blacksmith. His wife, Marie Magdelaine had died just 2 1/2 years earlier. Between his still morning of her death and the stress of events at Louisbourg at the time, the strength of Charlotte's support to the family would be desperately needed over the next year and a half. On 18 March 1758 at the age of 30 years, a Baptiste David was buried in the Cemetery of the Parish of Louisbourg. Although Fortress of Louisbourg historians document in the Family Reconstitution File of Jean Pierre David, it is not yet confirmed that this Baptiste is Jean Pierre's 4th son, Jean Baptiste. At the time of this burial, Jean Baptiste would have been approximately 32 years 7 months of age. In addition, it has been documented in an earlier Louisbourg baptism record that another Jean Baptiste David La Vigne was an inhabitant of Louisbourg and a ship captain. The cause of Baptiste's death is unknown. However, it may have been related to his possible military profession and the 2nd siege of the Fortress of Louisbourg in 1758. Fre Patrice LaGree presided at the burial. On closer review of the original source document folio that this burial record appears within, the 2 prior burial records of a Jean Cousin La Vigne and a Julian Cousin are dated the same day as Baptiste's burial and have very similar wording. Could it be that these 3 men died in a naval battle related to the 2nd siege of Louisbourg? On 26 July 1758, the British captured Fortress of Louisbourg for the 2nd and final time. The terms of the capitulation of the fortress mandated that all captured military personal and remaining Acadian inhabitants be immediately deported to either England or France. The British began rounding up all French and Acadian inhabitants on Île Saint-Jean in preparation for their deportation to France. Between September and October of 1758, about 3,100 inhabitants were captured and deported on 13 ships bound for French or English ports. As previously mentioned, secondary sources document that Jean Pierre's sons, Louis, Claude Thomas and Jacques Andre David were captured as prisoners of war by the British during one of the conflicts of the 2nd siege of Louisbourg in 1758. 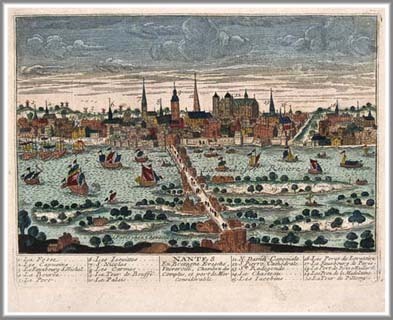 They were transported by the British first to Bristol, England in 1759, and later to Southampton on May 14, 1763. On May 26, 1763, they were transported to France on the frigate La Dorthee. The final siege of Louisbourg by the British in 1758 and the deportation of all French Acadian inhabitants from the homelands, which they had nurtured and cherished for over 150 years, closed the final chapter of the lives of the Jean Pierre David family in Nouvelle France. By this time, Jean Pierre's wife, Marie Magdelaine, along with at least 5 of their children, Pierre, Magdeleine, Jean Baptiste, Etienne Thomas and Marie Magdeleine, were deceased. The fate of 6 other children, including Jean Jacques, Francois, Jeanne Angelique, Jacob and Joseph, were unknown, if in fact they had survived at all. Michel, his wife, Genevieve and their 1st six children were now struggling for survival through their 4th winter in Snow Hill, Maryland after their deportation from Grand-Pré in 1755. Louis, Claude Thomas and Jacques Andre were living as prisoners of war in Bristol, England. Jean Pierre's oldest surviving daughter, Marie Josephe, her husband Jean Paul Pouilly, and their 4 children had already been deported on the 1st wave of ships bound for France in the fall of 1758. Source records confirm that the family arrived in Rochefort, France by 10 October 1758, however, the out come of that arrival tragically ended with the deaths of Marie Josephe and her youngest daughter, Anne Louise. Of the 3,100 Acadians deported to France at that time, it is said that only about 1,500 survived the crossing while the remainder died at sea due to drowning, disease or illness. As far as is known, 12 of Jean Pierre's 17 children were still alive in 1758. He had 10 grandchildren, although he possibly did not know of Michel and Genevieve's last 2 since it is unknown whether or not he knew that Michel's family was living in Snow Hill, Maryland. After the fortress fell to the British in the summer of 1758, all that remained of the Jean Pierre's family at Louisbourg through the winter of 1759 was Jean Pierre and his 2 daughters, Francoise Charlotte and Jeanne Olive. He was then about 64 years of age and most likely not actively working as a blacksmith. It's almost certain that Charlotte and Jeanne Olive would have been caring for Jean Pierre and his household as was the custom in those times. His wife had died four years earlier. Between his still morning of her death, his age and probably declining health, as well as, the stress of events at Louisbourg at that time, Jean Pierre would have desperately needed the strength of his older daughter, Charlotte, for her support and care giving during the next 8 months. At the age of 30 years, recently widowed with no children to care for, Charlotte turned her full attention to providing for her father and her younger sister. How Charlotte dealt with this challenge over the next few months may never be known, but accept the challenge she did to comfort and care for her father in the waning months of his life. Sometimes after the death of Charlotte's 1st husband in November 1757 and prior to the end of April 1759, Charlotte married Jean Baptiste DeBroise (DeBroize), an 18th century self-made tradesman with many skills and abilities. He was a prominent master blacksmith, shipbuilder and property owner within the community of Louisbourg. The exact date and place of their marriage is unknown but in all probability, it would have been in Louisbourg and within 18 months of her 1st husband's death. Exactly how Charlotte and Jean Baptiste met and developed a relationship is unknown but it is highly likely that the became acquainted as a result of her father and Jean Baptiste sharing work on many projects in the King's forge at Louisbourg. Jean Baptiste was exactly what Charlotte needed to support her and her family during this time of crisis. Likewise, Charlotte was exactly what Jean Baptiste needed to help him care for his children from a previous marriage after the death of his 1st wife in March of 1757. By March of 1759, the exodus of the remaining French Acadians from Île Saint-Jean and Louisbourg was drawing to an end. Charlotte and Jean Baptiste's families, now one in the same, were preparing for their exile departure to France. It is unknown if this departure was at the hands of the British on one of their Acadian deportation ships or by other self provided means. From numerous primary and secondary source records, we know that Jean Baptiste was very active in the shipbuilding trade at Louisbourg. Some of these records in the 1759 to 1763 timeframe document that Jean Baptiste was not only a shipbuilder but a ship owner of the brigantine, Marie-Francoise, as well. In December of 1762, almost 4 years after his arrival in France, he attempted to sell his ship to an agent of King Louis XV to fund the building of a sawmill in French Guyana. Could this ship, the Marie-Francoise, have been Jean Baptiste and Charlotte's means to exile in France? Or, did they suffer through the deplorable conditions of a voyage to France that so many other Acadians experienced on British deportation ships at sea. Whatever the means to an end, Charlotte, her new husband, Jean Baptiste DeBroise, his 2 children, Marie and Guillaume Andre by a previous marriage, Charlotte's younger sister, Jeanne Olive and the deceased body of their father, Jean Pierre, arrived in France at the Port of La Rochelle on 28 April 1759. The primary source below, extracted from a La Rochelle port ships arrival manifest dated 28 April 1759, lists as a family the names Jean Baptiste, Charlotte and their children within a "General list of families, headquarters officers of the sword, feather and justice, traders, residents and other key individuals of the Île Royale landed at La Rochelle, both existing parties to the said place with permission to various parts of the kingdom ". Interestingly enough, Jean Pierre's name does not appear along with Charlotte's new family within the extract above but does appear within the port's ships arrival manifest listed with a group of 46 other passengers in the extract below. Unfortunately, after close review of the port's arrival manifest, it appears that this group of 46 passengers may have died during there deportation voyages and were "mort en arrivant", i.e., "dead on arrival" at La Rochelle. This 1759 port manifest is the second to last primary source recording uncovered to date of Jean Pierre's life. 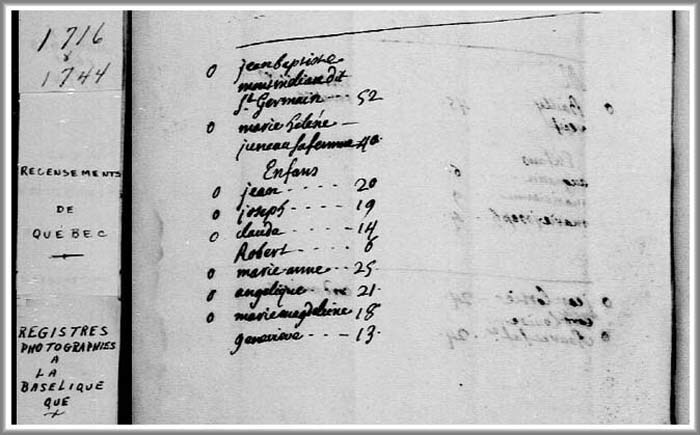 Other, abstract recordings of Charlotte and her family in a 1762 Census of Acadians in Saint-Milo or Saint-Servan, France do not reference Jean Pierre. Further review and translation of this ship's manifest reveals, on page 37, the title of a group of 46 names of which Jean Pierre's name is listed. The transcription of this title. Particulier et ouvrier sans famillie, translates as, Individuals and workman without families. On page 38 of the port's arrival manifest, Jean Pierre's name appears as one of this group's 46 passengers. The transcription of his name. Jean David dit St Michel, forgeron, translates as, Jean David dit St Michel, blacksmith. The writing to the left of Jean Pierre’s name is illegible. On image pages 41 through 44 of the port's arrival manifest, a series of passenger head count summaries appear totaling at the end of the manifest, 1,177 passengers. One of the prior summary count total descriptions, which appears on image page 42, list a total of 46 individuals. This passenger head count corresponds to the 46 names listed on image pages 37 and 38 of which Jean Pierre's name is included. The transcription of this summary total description, Debarquai ils et qui sont mort en arrivant....., roughly translates as, They landed and are dead on arrival ...... If this partial transcription and translation is accurate, those 46 souls, including Jean Pierre David dit Saint Michel, died sometimes during there deportation voyage to France. Tragically, the 6 week voyage to France proved more than Jean Pierre's age and health could withstand and at the age of 60 he died in the arms of his daughters, Charlotte and Jeanne Olive, at sea. On the 30th of April 1759, 2 days after the families arrival at La Rochelle, the remains of Jean Pierre David were laid to rest at the Cemetery of the Hospital General of La Rochelle. His burial record below clearly lists the signature of his son-in-law, Jean Baptiste Debroise, as witness to the burial. Jean Pierre David dit Saint Michel, born about 1698 in Saint Nazaire, Lorie-Inférieure, Bretagne, France, died at sea and was buried on the 30th of April 1759 at the Cemetery of the Hospital General of La Rochelle, France. Jean Pierre was a lifelong devoted husband to Marie Magdelaine Monmellian, beloved father of 11 sons, 6 daughters and 1 adopted daughter. He would eventually be grandfather to 27 known grandchildren, including, 14 grandsons and 13 granddaughters. Jean Pierre was a skilled tradesman as a master blacksmith, dedicated to his King and country, a devout Roman Catholic, a respected elder throughout the community of Louisbourg, who lived a long and prosperous life in Nouvelle France between 1715 and 1759. His life and legacy perpetuated one of the prominent French Acadian David families which survive today throughout southeastern Louisiana and where ever his David family descendents may have migrated over the past 250 years. Had it not been for Jean Pierre our lives, his descendents, past and present, would not have experienced their generations and the generations of their descendents. Further documented evidence which notates Jean Pierre in Louisbourg during this period has been extracted and compiled from original source documents into the Fortress of Louisbourg Historical Memoranda Series 1964 to Present H F 25 1989 titled Jean Pierre David dit Saint Michel: Blacksmith authored by Eric Krause of Krause House Info-Research Solutions. Marie Magdelaine Monmellian dit Saint Germain, wife of Jean Pierre David dit Saint Michel, was born and baptized on 04 April 1698 in Québec City, Province of Québec, Nouvelle France to Jean Baptiste Monmellian and Marie Helaine Juneau.> Her godfather was Jacques Query a tailor by profession, and her godmother was Marie Magdelaine Icehouse. Fre Francois Du pre, Priest and resident of Québec presided at the baptism. Marie Madeleine was the 3rd daughter and 7th child and of a family of 8 children that included (4) boys and (4) girls. From numerous Archives of Louisbourg records, it appears that her younger sister by 5 years, Genevieve Monmellian dit Saint Germain, was a close sibling and would follow Marie Magdelaine for many years from Québec City to the Fortress of Louisbourg. At the age of 57 years, Marie Magdelaine Monmellian, Jean Pierre's wife, who had shared his life for 38 years and who had born him 17 children, died and was buried in the Cemetery of Louisbourg on 1 February 1755. Fre Julien Moisson presided at her burial. It is quite likely that the heartbreak and stress of experiencing the tearing apart of her family at the hands of the British during Le Grand Dérangement in 1755 was more than she could bear. Her death record indicates she was "age of about sixty years" when she died, however, her actual age from her date of birth to her date of death was exactly 57 years and 27 days. Jean Pierre and Marie Magdelaine were the parents of (18) know children, including 11 sons, 7 daughters and 1 adopted daughter. 1. Pierre, a son born about 1718 somewhere between Québec City and the Fortress of Louisbourg. He died on 29 Jan 1730 at the Fortress of Louisbourg. 2. Michel, a son born about 1720 somewhere between Québec City and the Fortress of Louisbourg. He died in St. James Parish. Louisiana. The date of his death is unknown at this time. 3. Magdeleine, a daughter born about 1721 somewhere between Québec City and the Fortress of Louisbourg. ;She died on 09 February 1733 at the Fortress of Louisbourg. 4. Marie Josephe, a daughter born on 09 November 1722 at the Fortress of Louisbourg. She died on 10 October 1758 at St-Louis de Rochefort, Charente-Maritime, France. 5. Jean Jacques, a son born on 19 June 1724 at the Fortress of Louisbourg. The date and place of his death is unknown at this time. 6. Jean Baptiste, a son born on 23 July 1725 at the Fortress of Louisbourg. He died on 18 March 1758 at the Fortress of Louisbourg. 7. Francois, a son born on 16 June 1727 at the Fortress of Louisbourg. The date and place of his death is unknown at this time. 8. Francoise Charlotte, a daughter born on 11 April 1729 at Louisbourg, Acadie. The date and place of her death is unknown at this time. 9. Etienne Thomas, a son born on 20 December 1730 at Louisbourg, Acadie. He died on 01 April 1733 at the Fortress of Louisbourg. 10. Louis, a son born on 02 September 1732 at the Fortress of Louisbourg. The date and place of his death is unknown at this time. 11. Claude Thomas, a son born on 21 December 1735 at the Fortress of Louisbourg. The date and place of his death is unknown at this time. 12. Jacques Andre, a son born on 30 November 1737 at the Fortress of Louisbourg. The date and place of his death is unknown at this time. 13. Jeanne Olive, a daughter born on 10 July 1739 at Louisbourg, Acadie. She died on 4 July 1805 at Cayenne, French Guyana. 14. Marie Magdelaine, a daughter born on 17 January 1741 at the Fortress of Louisbourg. She died on 30 January 1752 at the Fortress of Louisbourg. 15. Jeanne Angelique, a daughter born on 21 December 1743 at the Fortress of Louisbourg. The date and place of her death is unknown at this time. 16. Jacob, a son born between 1745 and 1749 in France. The exact date and place of his birth and death is unknown at this time. 17. Joseph, a son born between 1745 and 1749 in France. The exact date and place of his birth and death is unknown at this time. The following chronological history of updates document the changes that have been made to this ancestral life story and the date those changes were made by the author. Copyright © 2009-2015 Davids of New France. All rights reserved.